I have been truant far too long! But here I am, unveiling the cover for the third Kate Clifford, A Murdered Peace, which will be published on 2 October in the US, UK, and Canada. 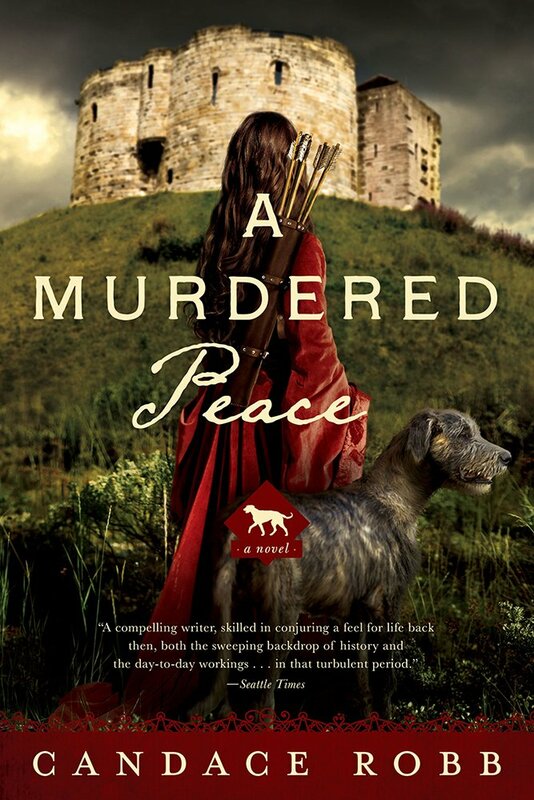 At long last Kate is depicted with a bit of weaponry and one of her wolfhounds. I’m pleased. Yes, I know, that’s the ruins of Clifford’s Tower in the present, not York Castle as it would have been—far larger, walled, a true castle complex, but one must choose one’s battles. It is deep winter in York, 1400, the ground frozen, the short days dimmed with the smoke from countless fires, the sun, when it shines, low in the sky. It is rumored that the Epiphany Rising, meant to relieve the realm of the Henry the usurper and return King Richard to the throne has, instead, spelled his doom. As long as Richard lives, he is a threat to Henry; so, too, the nobles behind the plot. The ringleaders have been caught, some slaughtered by folk loyal to Henry as they fled west, and the king’s men now search the towns for survivors. A perilous time, made worse for Kate Clifford by the disappearance of Berend, her cook and confidante, shortly after Christmas. Her niece saw his departure in a dream—he said he was honor bound to leave. Honor bound—to a former lord? One of the nobles who led the uprising? Is he alive? She is hardly consoled when Berend reappears, wounded, secretive, denying any connection to the uprising, but refusing to explain himself. When he is accused of brutally murdering a spice seller in the city, Kate discovers a chest of jewels in his possession. Some of the jewels belong to her old friend Lady Margery, wanted by the king for her husband’s part in the uprising. For the sake of their long friendship, and the love she and her wards bear for him, Kate wants to believe Berend’s innocence. So, too, does Sir Elric. And he has the powerful backing of the Earl of Westmoreland. All Kate need do is confide in him. If only she trusted her heart. I’ve just recently completed the final edit and it’s now with the copyeditor. For this edit I read the manuscript aloud, listening for repetitions, infelicitous language, and what I think of as the overarching melody of the book. It’s remarkable how much more I catch when I’m reading aloud. What struck me was that although the action of the book arises from the Epiphany Rising and Richard II’s imprisonment in Pontefract Castle, it’s the characters who carry the story. All the characters I’ve come to love–Kate, Berend, Elric, Lille, Ghent, Jennet, Eleanor, Marie, Petra, Phillip, Lionel (well, I don’t exactly love Lionel), Clement, Griselde, and a few new to the series. And that’s just how I want it to be. There is a great deal of sorrow and conflict, but some sweet joy as well. I’m proud of it. 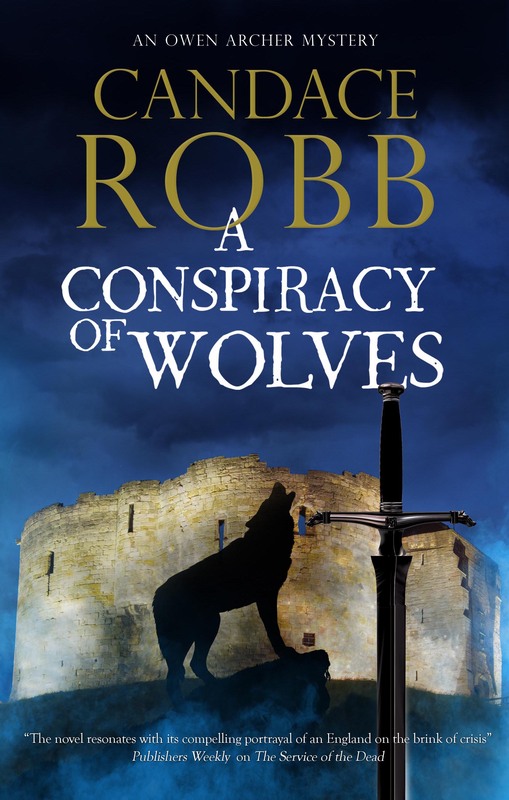 Meanwhile, I’m hard at work on the 11th Owen Archer, A Conspiracy of Wolves… more about that soon!